Want FREE Essential Oils Each Month? Here’s How! You’ve heard the hype. Unless you are not into wellness at all, it is hard to miss the buzz about essential oils. Yep, you can even get essential oils in the big box stores now. I use Young Living Essential Oils because they are the best and I want to tell you how you can receive free essential oils each month. No. You don’t. Really. If you share the oils with others (and if you love the oils you likely tell others about them…) you can take advantage of Young Living’s business model. Young Living is based on building relationships and supporting others within a team of like-minded people. So if you are a member of my team and you refer someone to me, I will let Young Living know about your referral and you will receive a Thank You check directly from Young Living. How cool is that?! You refer your friends and family to your favorite restaurants, doctors, shops- this is the same but with a sweet reward! Ok. So how do I get these free oils? Here’s how it works. You don’t have to become a business builder- that means you don’t have to decide to turn Young Living into a part-time or full-time business. You can opt to just share organically- share the oils naturally – and when people want more information, assist them with a sign up, or invite them to attend an essential oils workshop. For instance, I hold a few workshops a month in my Havana location. Anyone who is on my team can send folks my way- for a class or an individual consultation- and even a phone call if that works better. You don’t have to pitch anything- just point them in the right direction when they ask. You can assist and participate in the referral process as much or as little as you want. Bottom line, if you bring someone onto our team, you will be rewarded AND you will be able to enjoy more of that oil infused lifestyle! If you purchase 50 PV (approx $50) during a calendar month and someone you refer signs up for a Premium Starter Kit, you receive $50 the following month. With that same 50 PV purchase, i you 2 people you refer sign up for a Premium Starter Kit, you receive $100 the following month and so on. So why wouldn’t you want to receive a Thank You Check from Young Living for sharing the oils with others? That sounds simple right? Here’s more for those of you who like details. 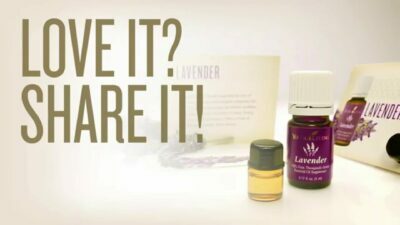 If you complete an order of 50 PV or more by the end of any calendar month you will qualify to earn bonuses on the orders of any new sign ups under you in their first three months as members of Young Living. You make 25% on any PV they purchase during their first three months and a $25 Starter Kit Bonus if they sign up with a Premium Kit. For a new sign up this month with a Premium Kit that is around a $50 bonus and similar to getting your order refunded! You will also qualify to receive retail commissions on any customers in your group. If you complete an order of 100 PV or more you will also be eligible for commissions on the PV of any orders on your downline. For your first level sign ups, this is 8% of their total PV after they have been a member for three months or more. This is completely optional on your part, but I certainly wouldn’t want you to miss out because we didn’t do our part in explaining this opportunity to you! You might be like me and always have a list of oils, supplements, and personal care products you want to order waiting nearby, making this a perfect opportunity to stock up. I like to order each month using the Essential Rewards program so I get the extra perks of cheaper shipping, points for free product, and I can know I will never miss out on commissions with a monthly order being placed. Plus, there’s no commitment and you can cancel at any time.